WESTFORD, MA — April 4, 2017 – Tyco Security Products introduces EntraPass Go Pass support for Apple Watch®, the industry’s first Apple Watch® mobile credential that allows card holders to use the watch as a mobile access control credential, facilitating quick entry and exit through access points without an access card. 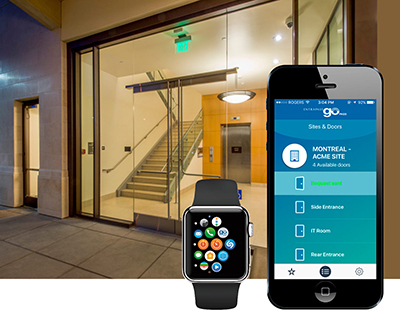 EntraPass Go Pass for the Apple Watch extends the power of the EntraPass Go Pass mobile phone application to the iOS Apple Watch environment. Once the application is downloaded to the phone paired with the watch, the “Go PASS” icon will appear on the watch indicating to the user that the app is now ready to be used on their Apple Watch. A list of the end user’s favorite doors will appear once the app is opened and the user can simply tap on the appropriate door to gain entry. All user activities are recorded on the EntraPass server for the system administrator. EntraPass Go Pass can help reduce the problem of lost cards and can be an ideal solution for visitors, temporary workers or high turnover populations where frequent card issuance can be an administrative burden. The app is available with traditional EntraPass Corporate or Global Editions, or as part of the Kantech hattrix hosted/managed security service. Using EntraPass Go Pass with support for the Apple Watch®, cardholders download the EntraPass Go Pass app to a mobile phone and then accept a credential invitation from the system administrator. Once the invitation is accepted, end users can then gain access to doors simply by pressing the appropriate icon of the door in the app on the phone or on the paired Apple Watch. The app communicates directly with the access control system’s server via Wi-Fi or cellular connection, allowing organizations to leverage their existing card reader infrastructure for added cost-savings, while also simplifying credential verification for card holders. For more information, visit Kantech at www.kantech.com. control technologies are ready to use right out of the box, and provide solutions that are compact, and easy to use for smaller businesses while scaling to meet the needs of larger businesses. Kantech solutions can easily link to American Dynamics video systems and DSC alarm panels to provide an integrated, holistic security solution. To learn more about Kantech products, visit www.kantech.com.